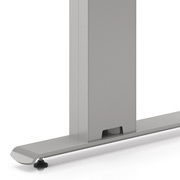 Freestanding table with 11" x 22" rectangle bases. 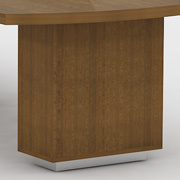 Tailgate is a series of collaborative tables designed around a unique power and communication trough, making interaction and data sharing simple and straightforward. 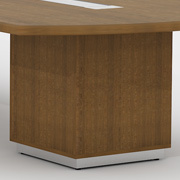 Available with two base designs and endless finish options, Tailgate can be specified to fit virtually any environment from boardroom to hardworking collaborative groupings. 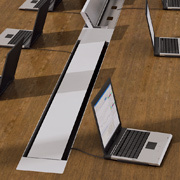 Access to power and/or communication is instant with the Tailgate Power and Communication Trough that runs along the center of the table surface. 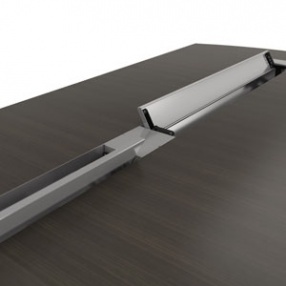 The trough door has dual hinge, allowing users to access power and/or communication from either side of the table. 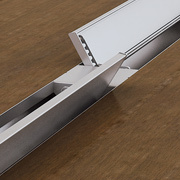 Ports within the trough can be customized to meet your needs. 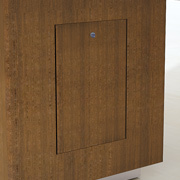 Tailgate Tables will adapt to the inevitable changes of technology. 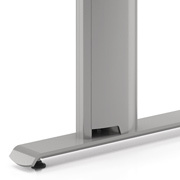 Rectangle Plinth base interior dimension is 9 3/8" x 20 3/8"